LC100 Waist High Turnstile is essential for office buildings, educational institutes, and amusement parks. For a commercial building, you will need a heavy-duty turnstile that can stand up to heavy use. At wipaq, we sell LC100 turnstile that comes with an easy mechanism which is durable and reliable for high-traffic flow . Wipaq.ae is your trustworthy source for LC 100 Turnstile. Our catalog features hundreds of security system and other products. Whether you're searching for the turnstile, id card printer, or access control system we've got what you need. If you have any queries regarding our LC 100 Turnstile selection, please call our customer care team at +971 4 2666524 and we'll be happy to help! The Portable LC 100 incorporates a sturdy non-slip, diamond tread base plate, with an attached guide rail. The width of the passageway between cabinet and rail is 18.5 inches. The Guide Rail is made from brushed stainless steel tubing 1¼ inch in diameter. Mounted to the back of the base plate are two high-density polyurethane wheels, 3 inches in diameter to facilitate movement of the LC 100 over most level surfaces. The counters are capable of being reset with a key (optional). This option includes an unlocking solenoid and electronic interface board with adjustable time control (standard) capable of controlling one direction of traffic through an access control device (card reader, RFID, biometric reader). The adjustable time control may be used for automatic relocking of the turnstile if entry is not completed (adjustable from 0.5 to 60 seconds). All our turnstiles operate from 24 VDC low voltage. Manually places the turnstile out of service using a key lock. 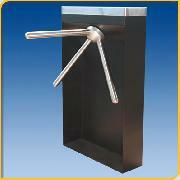 Enables the turnstile to allow passage in the event of a power failure. Red and Green high intensity LEDs provide status indicators that can be mounted in the hinged lid or on the end of the cabinet. They may be used in conjunction with a card reader to indicate the turnstile status, locked ready for presentation of card or equivalent entry token (red LED) or to indicate the turnstile is unlocked and ready for passage (green LED). Alternatively, the red can be used to indicate the turnstile is out of operation and green that the turnstile is in operation. The LC 100 can be equipped with an electronic coin or token acceptor which can be set for any size token or coin. The LC 100 turnstile body has been designed with sleek, modern looks to fit today's world. The main body is constructed from 10 gauge carbon steel with a ¼" thick base plate. Both are protected with a tough industrial-grade black powder coat finish (custom colors or Satin-stainless available). The top cover is made of type 304-brushed stainless steel and has space to mount special card readers, indicator lights, and/or other add-ons.